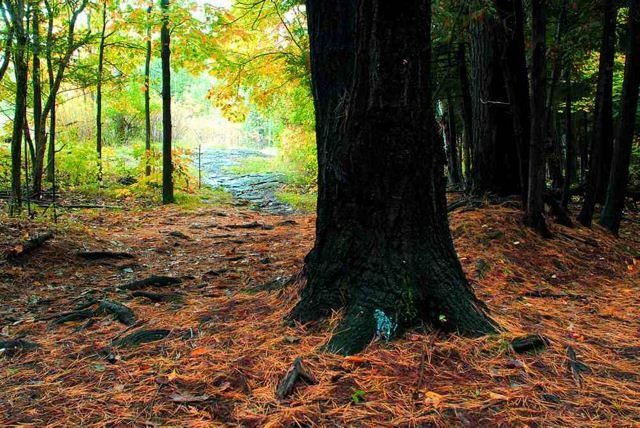 Save the Last Remaining Old Growth Forest in the City! There’s still hope for saving Ottawa’s South March Highlands wilderness area, but only if City Council votes on Wednesday, October 6 to purchase the land north of Kanata’s Beaver Pond. That’s when Council will consider a motion put forward by Councillor Marianne Wilkinson (Kanata North) that the City obtain, by expropriation if necessary, lands owned by KNL Developments (a partnership between Urbandale and Richcraft). Clearcutting is likely to begin soon if Council votes against the motion. The South March Highlands area is rated as a Provincially Significant Area of Natural and Scientific Interest (ANSI) for both its Life Science value (895 hectares) and its wetlands (114 hectares). According to the Coalition to Protect the South March Highlands, the closest old-growth forested area to Ottawa that has 2 ANSI ratings (for wetland and wilderness) is Algonquin Park. Its many recreational uses include walking, mountain biking, orienteering, cross-country skiing and snowshoeing. Once it’s gone, we can’t get it back. Join the Pledge to support ongoing commitment to the area and to the vision of a world-class ecological park in Ottawa. To find out more about the area and the motion, check out the Facebook group I want to save the land North of Beaver Pond Park in Kanata Ontario, @SouthMarch on Twitter, the Ottawa Citizen story about the motion, the Coalition to Protect the South March Highlands website or this video about the area. This land must be protected. We don’t need more subdivisions and paved parking lots. Natural habitats are disappearing and once they are gone, can never be recovered. We cannot lose this chance to save what remains of the Beaver Pond Forest. Update: On Oct. 6 City Council voted to defer considering acquisition of the land until Nov. 24. They also asked city staff to come up with information and a plan and for KNL Developments to hold off on cutting trees. See http://www.ottawacitizen.com/business/Plans+raze+Kanata+forest+delayed/3635763/story.html#ixzz124w09TPV for details. Support from across Ottawa is still needed to save the forest; you can keep up with the latest through the Facebook group mentioned in the post and the Coalition’s website and Twitter feed (@SouthMarch). It is very important to sustain our environment and grow as a community with business as well. If we must cut down trees, we should do our best to conserve and replenish.